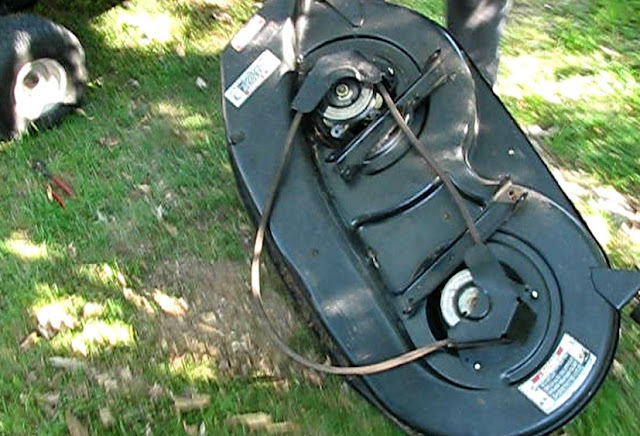 The deck belt belt on this 1998, 38" MTD riding mower shredded and fell off mid-cut. Replacement is no ten minute job. The entire deck must be detached and removed. Then the guards must come off. It will take an hour or even two for a first timer. This is also a very good time to inspect and possibly sharpen or replace the blades. We replaced them. 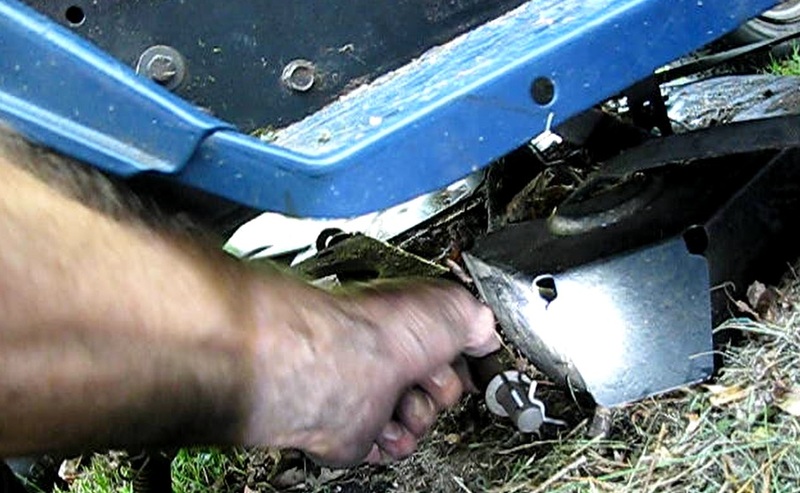 1) Remove and ground the spark plug or disconnect the battery. 2) Lower the deck all the way down by moving the lever all the way down. 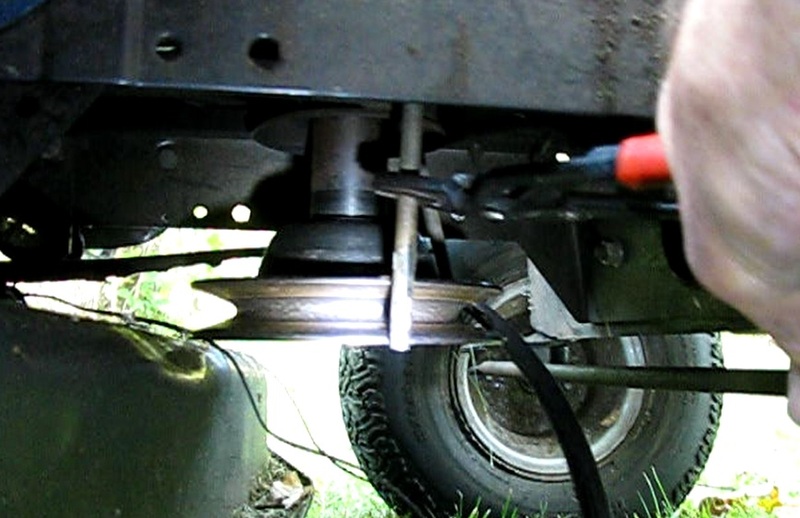 3) Use a vice grip pliers or spring removal tool to disengage a spring by the right rear tire. This is a strong spring. As it will fall off during the belt change process, note where it mounts on the end of a bar on the stabilizer assembly. 4) Raise the deck back up to the "blades off" position. 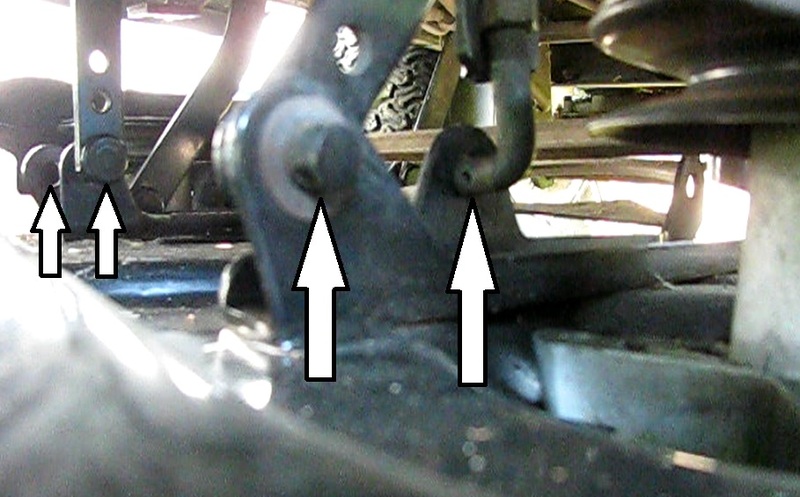 5) Remove the two belt keeper pins on either side of the engine pulley. These 6 inch long pins have a 1/4" hex end. A 1/4" socket or channel lock pliers can be used to turn them off. 7) There are seven clips and washers that must be removed to disengage the deck. Start on the left rear of the mower. Remove the second clip in and the washer. This is for the stabilizer rod. Then pull out the rod from the right rear. The pin on the right side can stay on the rod. 8) Remove the other six deck hanging clips. There are two on each side on the front and one on each side on the rear. 9) Raise the deck to the "blades off" position. It might also help to jack the front up a bit. 10) Pull the deck out and remove the old belt. 11) Remove the two guards. There are two 1/2" hex bolts for each guard. 12) Inspect the blades. Ours were worn beyond usability, so we replaced them. 1) Place the new belt over the pulleys. 2) Re-install the two pulley guards with a 1/2" socket and ratchet. 3) If needed, replace the blades, jamming a large screwdriver or other tool to hold the blade for tightening. 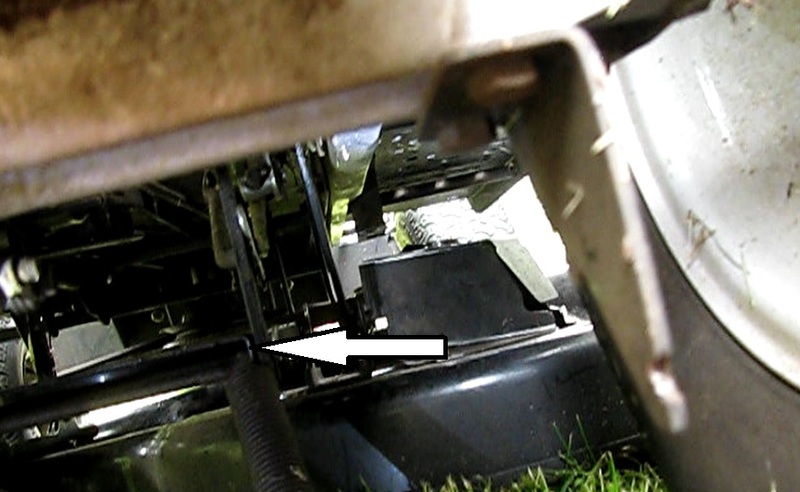 4) With the lever in the raised position (and the front end of the mower jacked up, if desired) slip the deck into position under the machine. Note: there is a hanging bar on the right side that is longer and comes from the back. It will need to be pivoted to the front to reach it's final position. 5) Move the deck lever into the forward (down) position. 6) Slip the belt over the engine pulley. 7) Place the six clips and washers back on. Four in front and two in the rear. 8) Slip the stabilizer rod through from the right rear and align it with the hole on the opposite side. It may be necessary to tap it through with a hammer. install the washer and pin. 9) Re-mount the rear spring back on the bracket by the rear wheel. 10) In-stall the two belt keepers beside the engine pulley. 11) Install the spark plug and connect the battery if disconnected. 12) Test and mow. Happy cutting!